Amara Royce: NTL prize pack giveaway continues! 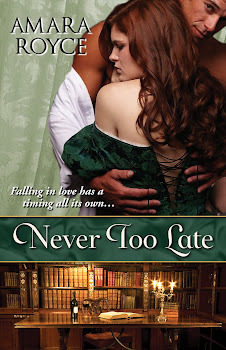 Just a little reminder that the NEVER TOO LATE prize pack giveaway runs until May 9th, and there are multiple ways to enter! Open in the US and Canada. Void where prohibited. Well, I heard NEVER TOO LATE? from you of course! I have to many favorite authors. 1)Stephanie Laurens for bringing me into the world of Historical romance. 2)Sarah MacLean and Madeline Hunter for bringing me great love stories! 3) Heather Snow and Rose Gordan for remembering me~ LOL nahhh I love their wide range stories. 4)Karina Cooper for bringing me into the SteamPunk romance genre. Which I found I most definitely love long before I knew it was called steam punk. Kipha--Thanks so much for your comment! I'm a big fan of Sarah MacLean, and the other authors are all on my TBR list (which has gotten frighteningly long)! I found out about you and your debut novel through the blog tour. Tin--Thanks for your comments! And Sherry Thomas is one of my favorites too--she's an auto-buy for me!